The traditional way of tanning a deer hide is by using the deer’s brain oils. Nowadays, professionals use chemicals and acids in the process. Here, we’re gonna show you a simple and DIY way of using salt, baking soda, and white vinegar. It takes a lot of manual labor, and a lot of time, but the end result will certainly be more than a mere memento. First of all, make sure you keep the skin, and work on it, in a cool and dry place. Skin the deer and bone out the tail. Use a sharp knife to cut away all the leftover meat and fat you may have missed the first time on the skin. Once done with it, spread the skin out fur side-down and completely cover it with salt. You will likely experience moisture being drawn out, and if that’s the case, wipe the salt off and add a new layer of fresh salt. Repeat it until it stops releasing moisture. Then leave it like that to rest for a night. Next day, soak it in clean fresh water, rinse and leave it again for a couple of hours to rest until you feel the skin is soft under your fingertips. You can do a bit of scraping with the back edge of a knife or something similar, but it’s better to wait until after the next step. Make a ‘pickle bath’ using equal parts distilled white vinegar and water, plus two pounds of salt per gallon of solution, and leave the skin in it, stirring it occasionally, for three days. This step is important, as it helps prepare the skin for tanning. After three days, make another ‘bath’ with four gallons of water, and two cups of baking soda, and soak the skin in it for up to forty minutes. Rinse it out with clean water multiple times, and then dry it out with a towel. Now you have your skin that’s ready for tanning! You can use professional wet-scrape or dry-scrape tool, or the back of your knife, just keep in mind that whatever you use, the blade should be dulled a bit so it does not damage the skin. Also, before you start tanning, use a tanning oil solution (like NW Trappers Hide Tanning Formula) to protect the skin from cracking and drying out. When you think it’s been worked on and refined enough, let it sit overnight, then start over again. The more you work on it, the softer skin will become. That’s it! As you can see, nothing terribly hard to it. It’s just a lot of work and it’s time consuming. Yet, in the end, the reward is a wall hanging, deer skin, or a rug you can be proud of! See also a previous article on the subject for further instruction. 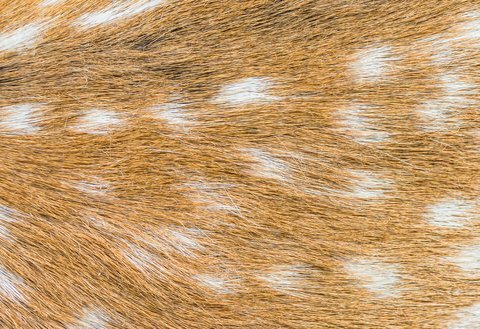 © Narongrit Dantragoon | Dreamstime.com – Close up shot of a deer fur background image.